The F-16 Air Defense Fighter (ADF) was a special variant of the Block 15 optimized for the United States Air National Guard's fighter interception mission. Begun in 1989, 270 airframes were modified. Some were fully modified while few others were only partially updated. Avionics were upgraded (including the addition of an Identification Friend or Foe (IFF) interrogator with "bird-slicing" IFF antennas), and a spotlight fitted forward and below the cockpit, for night-time identification. This was the only US version equipped with the AIM-7 Sparrow air-to-air missile. Beginning in 1994, these aircraft began to be replaced by newer F-16C variants. By 2005, only the North Dakota ANG was flying this variant, with these last examples retired by 2007. Interestingly, two ANG units, the 169th FS Illinois ANG and 198th FS Puerto Rico ANG flew these aircraft in the ground attack role. A number of these aircraft were later refurbished and sold, including the aircraft operated by Italy Portugal operates F-16s with many of the ADF features, though these were new build. If you have every built a Hasegawa 1/72 F-16 over the last 20 or so years, you will find this to be an old friend. To make the ADF version, Hasegawa simply added a sprue to the standard kit that includes the new fin, IFF antennas and the AMRAAM launchers with some missiles and the wing mounted 'beer can' antennas. Unlike the initial boxings, Hasegawa's canopy is clear and not smoked. The rest of the mold has held up rather well, despite what has to be thousands of pressings. Unlike most modern Hasegawa kits, this one includes both bombs and missiles to put on the pods. The large underwing fuel tanks and a centerline tank are included. Cockpit is somewhat basic with decals for instruments and a rather plain bang seat, but nothing that aftermarket cannot cure. This special boxing includes a huge decal sheet with some very fancy markings for two specially painted aircraft with the AMI. One is the box art plane from the 10th Gruppo. One has to paint the rear of the plane with 'Super Italian Red', which is a sort of orange-red shade. 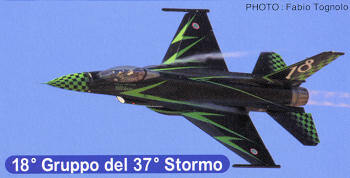 The oth er is an overall black aircraft with a lot of green checkers and green stripes from the 18th Gruppo. It looks like Hasegawa printed these numbers in white when it should be yellow if the photo is to be believed. Both schemes will be a challenge to paint and apply, but will make for a rather spectacular model. Some of us will want to do these as ANG aircraft, and while there are markings out there, they will be a bit of a challenge to locate. Those who really like commemorative paint scheme will find this boxing to be great. 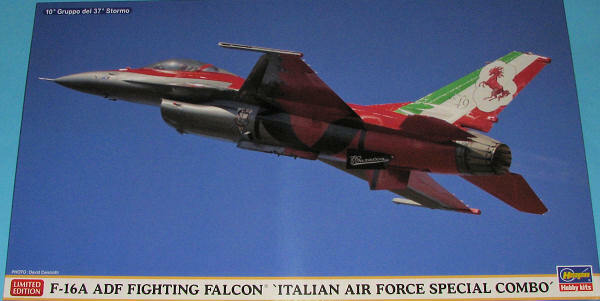 Those who want a 1/72 F-16A/ADF will be pleased as well, though the hunt will be on for markings. Aside from the Fujimi ADF kit, I think this may well be it. I got mine at GreatModels where you can find lots of kits, books and accessories.